We’re back in the blog biz after a couple of weeks away (one week r&r and one week locked in the studio). Few bits and bobs to update you all on - Firstly Mr Hoodee span some tasty funk on our good friend PH5’s Sunday show The Soul Explosion on ICR FM. All of us here at GCHQ wish ICR all the best as it’s now hitting the legal FM airwaves as well as the net. A true sign of these internet-savvy times as Hoodee’s mum emailed in for a shout out! On the gear front the Groove Criminals audio armoury has been swelling over the last few weeks. We’ve picked up another couple of truly fantastic Moogerfooger pedals (the mURF and the phaser) and a Watkins Copycat tape delay that is presently being serviced – we’ll post some nice pics when we get it back. 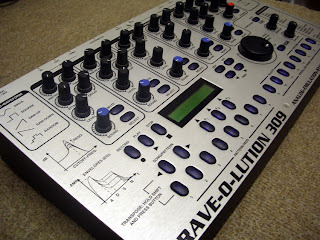 Finally we’ve been busy on a house –based set of samples for FM and got our mitts on a Quasimidi Rave-o-lution 309. It’s an analogue emulating drum and synth groovebox that sounds great and has plenty of knobs for fiddling with the sounds. Ours has been expanded with the extra ins/outs and the drum/synth expansions as well. It’s a really cool bit of kit and there’s always something about step/grid programming that we really enjoy. Unfortunately Quasimidi have sunk as a company and finding a download of the manual was a bit of a pain – if anyone ever needs a copy (or arrives at this page via Google looking for one) drop us an email and we’ll sort you out with the PDF. Likewise if anyone knows where we can get hold of the rackmount kit, let us know.